One look at the rose gold color of this Rosé and you know you are in store for something different. Not a wine to drink ice-cold; you'll miss the scent of apple blossom and strawberries. 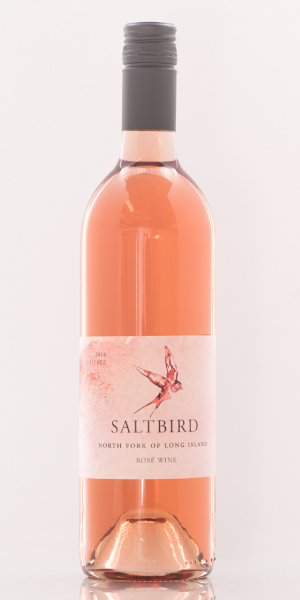 Concentrated rhubarb dances across your palate with a touch of pepper and the finish of grapefruit zest. Cabernet Franc and Syrah require a longer growing season and when used to make a Rosé deliver a wine that is both fresh and reflective of a full season of ripening. Rosé in my family is best enjoyed outside watching the garden grow with Grandma T’s shrimp mousse on light buttery crackers. An alternative pairing would be a charcuterie platter with Pâté de champagne, thinly sliced Bayonne ham, goat cheese drizzled with honey, cornichons, a handful of pistachios, and quince paste watching a lazy sunset over the water. The Cabernet Franc and Syrah grapes destined for Rosé were picked 1-2 weeks before the red grapes for table wines. Earlier in the ripening the grapes have a lower more natural acidity and brix, with fruit flavors that are fresher and brighter. The Syrah was picked and went directly to press, followed by a cool fermentation with aromatic yeast. The Cabernet Franc soaked for 8 hours before pressing, followed by an indigenous fermentation. Both fermented and aged in stainless steel, with the blend being made a couple of months before bottling.